26th December – St Stephen’s Day – sees a most curious tradition kept alive, linked to that tiny bird the wren. Indeed in some parts of Ireland the day is known as Wren Day. Ceremonies connected with stoning this smallest of birds to death are still re-enacted by groups known as the Wrenboys. Echoes of the tradition are to be found on the Isle of Man and, centuries ago, on the English mainland and in particular in Wales.The tradition is so ancient it may well be druidic (the gaelic word for wren is dreolín, which possibly derives from draoi ean, or ‘Druid bird’). Why kill the bird? Well, perhaps the tradition simply marked the end of the year with a mid-winter sacrifice, or commemorated the early Christian attempts to drive out paganism, who knows for certain? The wren has a reputation which its tiny frame belies. One story has it that the wren is the king of the birds, by virtue of a contest in the bird kingdom to find who could fly the highest: the mighty eagle soared into the skies, leaving all beneath him, except the wren which had hitched a ride on the eagle’s back. When the eagle tired and could ascend no more the wren flew a few feet above it, and landed to the acclamation that he was indeed the king of birds. In Druid lore the birds were a link between heaven and earth – it is possible the druids worshipped the wren and for this reason the Christians opposed it and celebrated the killing of the bird at Christmas time as a symbol of their new order. But the bird also has a name for treachery, for betraying your whereabouts to your enemies. Legend has that it was a wren which alerted the Jews to where St Stephen was hiding, leading to his capture and death by stoning. And was it not the case that when Cromwell’s soldiers were asleep and the Irish were about to attack, a flock of wrens rose into the air and wakened the enemy with the sounds of their wing beats? Had the same thing not happened when the Viking invaders arrived eight centuries before? 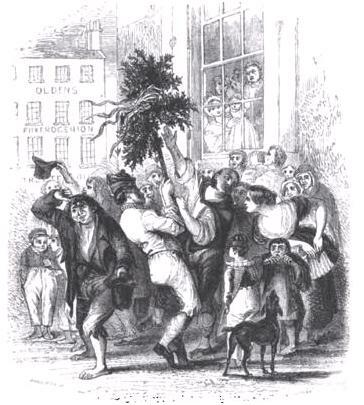 There are a number of such myths and superstitions about the wren and for centuries the Wrenboys would spend the weeks leading up to Christmas either stoning and killing the wrens, or collecting them and tying them alive to a holly (or other evergreen) bush. 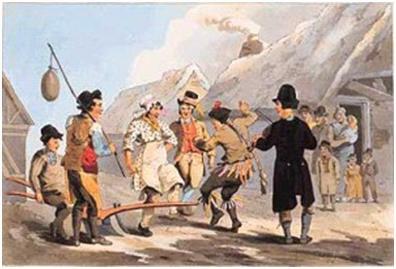 The Wrenboys would then parade through the town on St Stephen’s Day, knocking on doors. Householders would be asked to give a penny ‘to pay for the funeral of the wren’ – anyone refusing would run the risk of the Wrenboys burying the bird outside their home, a certain way of bringing bad fortune for the year ahead. Anyone making a gift of money would be rewarded with a feather from the bird. This way the Wrenboys collected enough money to finance an evening of liquid revelry at the local hostelry… with singing and dancing. The wren on its decorated pole had pride of place. 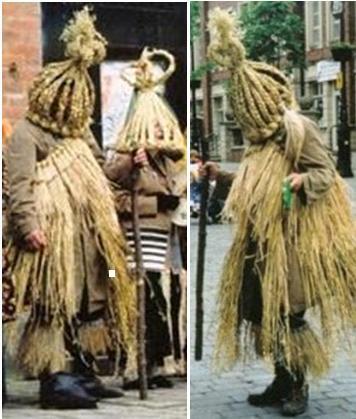 Traditions varied: in some the Wrenboys dressed as mummers in straw costumes; in others they blackened their faces with cork and dressed in old clothes (sometimes women’s clothes). Meanwhile in West Kerry tradition has it that the dancers paraded with a wooden horse’s head – harking back to the time of pre-Christian horse worship. The introduction of Christianity meant that the horse effigy also had to be burnt, and it is this that the dancers commemorate. St Stephens’s Day was caught in the furze. Give us a penny to bury the wran. Nowadays of course there is no bird killing – either a stuffed bird is tied to the holly pole, or an artificial one, and this is decorated with ribbons and holly and used for the parade. One particular group of mummers from South West Fermanagh known as the Aughakillymaude Mummers, keeps alive the tradition of such celebrations. Thank you for the article. As leader of Sidhe Gaoithe a group who play out Mummers at Christmas, Wrenboys on St Stephens Day and Strawboys during the year I am curious about some of the customs you mention: such as stoning the bird to death ‘still re-enacted’. Can you elaborate please as I have never heard of this, and certainly not in recent times. Also straw costumes are the preserve of Strawboys. Do you mean Wrenboys dressed as Strawboys? The Aughakillymaude group pictured above are dressed as Strawboys. My understanding is that in towns there would be a very definite ‘turf war’ between rival gangs as to who could be first to knock on the door. Second callers would just get turned away & traditionally not be expected to give twice. Would there have been just one group of Wren Boys per village/townland or was it a bit like Halloween is now with lots of different groups visiting each house? Digging for Gold in Laois.